(VEN) - The wider use of copper alloy-meshed instead of nylon-meshed cages in seafood farming has helped farmers increase incomes significantly while reducing losses and should be promoted. Nylon-meshed cage farming is popular in the country but has been blamed for clinging moss and disease-causing parasites, short-term replacement, difficult cage-to-cage transfer and losses of fish. To overcome these limitations, the Ministry of Agriculture and Rural Development and the Hai Phong People’s Committee permitted the International Copper Association Southeast Asia (ICASEA) in collaboration with the International Collaborating Center for Aquaculture and Fisheries Sustainability (ICAFIS) to implement the copper alloy mesh (CAM) project in seafood farming at Cat Ba Island, Hai Phong, in January 2014. Three-square-meter CAM cages and three 2m x 2.5m x 3m CAM cages were installed to farm grouper, while nylon meshed cages were also used ascontrols. According to ICAFIS Director Le Thanh Luu, the active copper alloy prevents mollusks and barnacles fouling the cages. Therefore, the cages have remained clean, despite being in the water for a year. Thanks to improved seawater environment, flow-undistorted cages and high-feeding effects, CAM caged fish has grown much better than in nylon-meshed alternatives and the survival rate is also 1.62 times higher. Moreover, the CAM caged fish survival rate after the outbreaks in 2014 reached 50.6 percent on an average while nylon-meshed caged fish survival rate reached just 24.8 percent. Profits from CAM cage farming is estimated at 1.5 times higher compared with nylon cage farming. CAM cages, when no longer used can be recycled as an environmentally-friendly material. 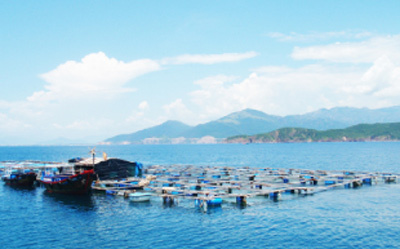 The use of CAM cages in seafood farming should be widely applied in Vietnam for sustainable development of the domestic seafood sector. The copper alloy has several advantages in fighting natural calamities, including storms, but depending on their intensity. In the case of large storms, it is advisable to move CAM cages for safe shelters. However, some farmers in Japan and the Republic of Korea have piloted large-framed CAM cages which proved able to withstand severe storms without needing to be moved, said Dr. Craig Craven, an American aquaculture technology expert. According to experts, this technology should be improved to suit Vietnam’s farming models including using larger meshes to reduce the initial cost and copper wire to tie instead of imported fasteners. In addition, CAM cage leasing models have also been considered to save farmers from large initial investments while encouraging the use of this farming technology to improve the values of fisheries. Copper alloy-meshed cages reduce repair and maintenance costs by 18 percent compared with nylon meshed alternatives and feed costs, can be recycled after six years of use, increase fish farming efficiency, and do not harm the environment.